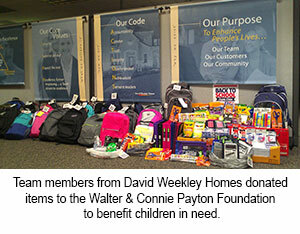 “We are so thankful that David Weekley Homes hosted a school supply drive for us,” said Nancy Hewlett, office manager, Walter and Connie Payton Foundation. Approximately 23 backpacks filled with school supplies were collected during the two-week drive. After collecting the donations, Team Members spent 20 hours sorting the supplies and delivering them to the organization to ensure the supplies would be distributed in time for the students to begin school with the tools needed to be successful. "Our team members were delighted to be involved in the back-to-school drive that will help children have a successful year in school,” said April Sjoholm, a marketing coordinator with David Weekley Homes.